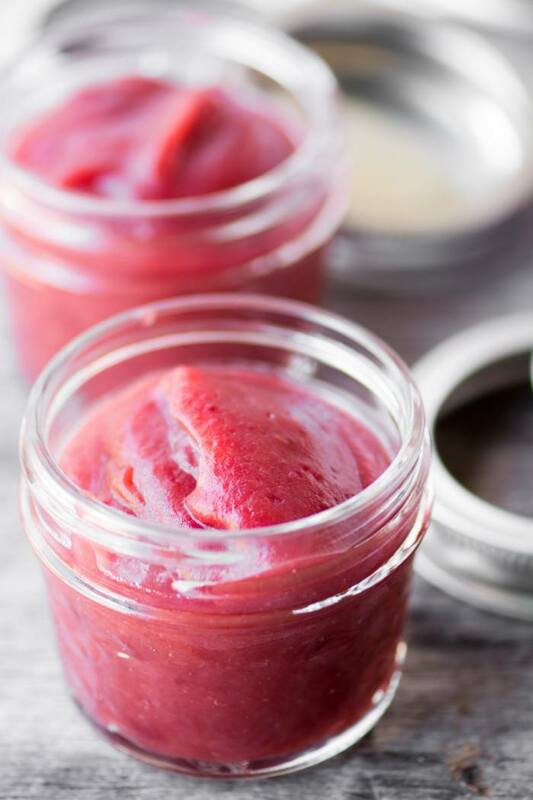 Healthy, no-sugar Crock Pot Cranberry Apple Butter livens up toast, biscuits, muffins, and scones this easy recipe is perfect for holiday gift giving! Wash the apples well, and cut them into large chunks, discarding the core and seeds. Add to the crock pot. Rinse the cranberries and add them to the crock pot. Give the fruit a stir and then cover and cook on HIGH for 4 hours. Give the pot a stir every once in a while to prevent sticking. If the mixture is sticking you can add a bit of water, but I didn't have to, the natural juices of the fruit should be sufficient. Puree the softened fruit in a high speed blender or food processor, working in 2 batches. Push the puree through a mesh strainer with the back of a large spoon, Force the puree through, you should be left with just a light layer of solids. Rinse out the strainer between batches. Rinse out the crock pot and return the strained puree to the pot. Bury a stick of cinnamon into the puree. Cook on HIGH, uncovered, for another 2 hours, or until thick and spreadable, stirring occasionally to prevent sticking. If you want to can your butter, make sure your jars are super clean, and process in a hot water bath for 10 minutes.